Customer Relationship Management (CRM) is escalating customer retention techniques and is bridging the gaps between customers and consumers in the process, helping enterprises to improve sales and profits. By leveraging the broad sets of technological trends designed to harness customer data and interactions, CRM is evolving at a very quick pace. CRM solution providers, owing to tough market competition, have been fine tuning software applications to bring CRM to the ‘very tactical level’ for accurately mapping target consumers, and updating them proactively—the reason for presence of new products and services in the market. Crafting applications for mobile and social media platforms has turned critical with realtime interactions being harnessed. Today, CRM landscape is evolving into a geo-location based forum, where solution providers are pushing the envelope to augment geo-located messages and offers by tracking consumer movements around and within a store—data analytics has scaled to new levels. This helps companies to better serve their customers by shoving offers based upon a consumer’s prior location and need. To accommodate challenging requirements of enterprises, multitude of CRM providers are rolling out technology solutions large enough in numbers to make spotting the right ones a herculean task. 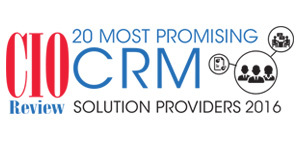 CIOReview has analyzed the unique capabilities of numerous CRM providers and has chosen the top 20 among them. The companies featured here have garnered vast knowledge and leveraged in-depth expertise to deliver unique CRM solutions and services. The list provides complete visibility into the present day world of CRM and the benefits they can offer you to stay ahead in the market competition. KAPTURE A cloud based Sales CRM Platform that automates all business processes.